All my life I've been a fan of The Jimi Hendrix Experience. (Who hasn't?) And, all my life I've been a fan of Arthur Lee and his band Love. A band name that, of course, doesn't turn heads, but a logo that does. And like band names that we hear over and over, the meaning and sound of 'Love' changes as we become familiar with the attitude of the music. 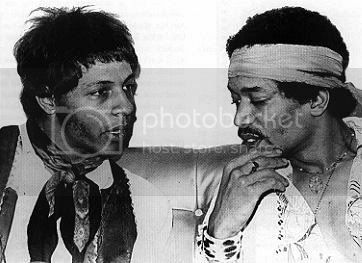 It's strange to me to even have to go down this road of holding Arthur Lee up as an artist I'd rather have you listen to than Hendrix. Jimi Hendrix is a special kind of guy. He's a great player, with a relaxed feel. Great compositions and a variety of styles (to a certain degree). A great singer. And, from all accounts, a sweet and fragile individual. Arthur Lee is different. He's a rougher person. But, he's as hard and as soft as Hendrix. Arthur is rough around-the-edges musically sometimes, where you hold your breath and hope he reels it in before it all falls apart. Other times he's as sharp as a tack and blowing your mind with odd songs that make Hendrix look conventional. As a matter of fact, it seems Elektra Records had the trifecta of gothic pop under one roof with The Doors, Tim Buckley, and Love. Heavy stuff. I wonder how Arthur and Jimi behaved around each other, knowing they played on a song together from Love's False Start album, "The Everlasting First." I simply do not know, though I have heard Lee's opinion of Jimi's arrival on the musical landscape. And, I'd think Lee could be a little miffed when a guitar master who can write great songs overshadows him. But, Arthur Lee writes more important songs, songs attacking injustice, songs pleading with you to understand, songs begging you to change. Arthur Lee, like John Lennon, George Harrison, and Ray Davies is a truth-sayer. And, like them, he knows how to fight with all his being for the truth. You can hear and feel the sadness that hurts his soul when he leaps out of a sweet melody into improv screaming. But privately, Arthur must have loved Jimi's spirit in order to make what is essentially a Jimi Hendrix record with 1972's Vindicator. Simply a masterpiece! What a record. Total Arthur doin' very Jimi. A wonderful tribute, whether intended or not. I could go on for a long time writing about my love for Love. I could also tell you how many years I basked in the glow of "Axis: Bold As Love." For now I only remind you to add posters of your own making. Stay out of the gift shops selling you another Hendrix poster. Make you own featuring Arthur Lee, James Honeyman-Scott, Dave Davies, Adrian Belew, Warren Cuccurullo, and anyone else that deserves a nod for all the guitar prowess they've wielded while getting absolutely no credit in the gift shops of the world! For, like Hendrix, these men were great players and great songwriters both! All hail the real rock 'n' roll history! A history that even I haven't finished investigating. But I'm not on this earth to talk to you about every person who's ever picked up a guitar. I'm here to point out the special ones. Those who have made a special mark in the pantheon of great songs. Enjoy your record collections and go down fighting! Jimi and Arthur did...in the deep black grooves of vinyl. Perfect. And now we have Black Beauty, which kills! Adam Ant: Every Album A Winner!